By virtue of this draw, last year's bronze medallist India are now placed fourth in the table in the six-team tournament. India wasted chances galore to settle for a 1-1 draw against England in the their second match at the Sultan Azlan Shah Cup hockey tournament in Ipoh on Sunday. It was India’s first point in the tournament after having lost 2-3 to Olympic champions Argentina in their tournament opener on Saturday at the Sultan Azlan Shah Stadium. Young Shilanand Larka (14th minute) scored his first international goal in the dying minutes of the first quarter to give India the lead, which the men in blue maintained till the 53rd minute, when Mark Gleghorne converted a penalty stroke. By virtue of this draw, last year’s bronze medallist India are now placed fourth in the table in the six-team tournament. The Indians, who have fielded a young and inexperienced team in the tournament under Sardar Singh’s leadership, only had themselves to blame as they wasted as many as nine penalty corners besides a few great scoring chances from the field. India were slow to get off the blocks as England put pressure on the rival citadel with continuous raids upfront. But India took the lead against the run of play a minute before the first quarter when Shilanand pounced on a rebound after Talwinder Singh’s initial shot was saved by England goalkeeper Harry Gibson. The Indians, however, were on top in the second quarter and earned as many as eight penalty corners with close succession, but the dragflcik battery of Varun Kumar and Amit Rohidas failed to breach the England defense led by goalkeeper George Pinner, who replaced Gibson. The third quarter witnessed a midfield slugfest between both the sides as England pressed hard for the equaliser and in the process secured a penalty corner, which was wasted. The Indians secured their ninth and final penalty corner in the 48th minute but as has been the story in the match, they failed to utilise the opportunity and it eventually proved costly for Sjoerd Marijne and his team. 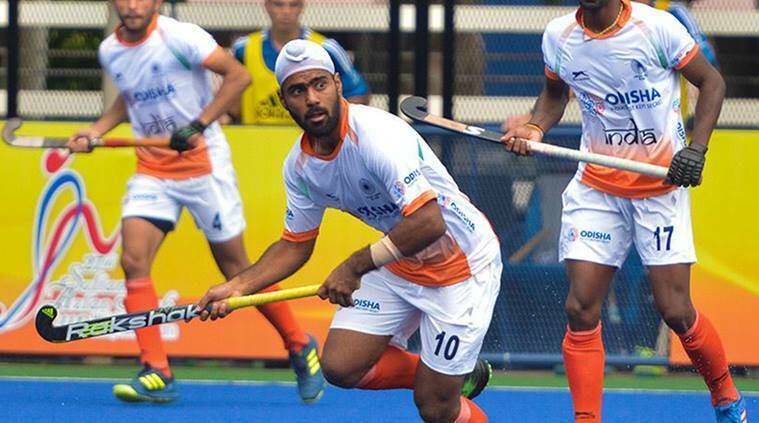 Seven minutes from the final hooter, England were awarded a penalty stroke for a stick infringement inside the Indian circle and Gleghorne stepped up to convert the chance with ease past goalie Krishan B Pathak. Thereafter, both the teams tried hard to find a winner but failed in their efforts. After a rest day tomorrow, India will next play world no.1 Australia on Tuesday, while England will be up against Ireland.